BUNDY CASE UPDATES | RANGEfire! First published in the Millard County Chronicle-Progress. There have been significant recent developments in the renowned Bundy cases in Las Vegas which seem to have received little, if any, attention here in Millard County. In addition to the Bundy cases’ general relevance throughout the West, Millard County has a direct tie to the case(s) through David Bundy, who is married to Marylynn Stoddard from Delta. Dave, Marylynn and their family had moved to Delta and were in the process of building a house when Dave was arrested in March, 2016, and subsequently incarcerated for almost two years awaiting trial. Since then, as the case evolved Dave Bundy and his brother Mel were classified as “Second Tier Defendants” based on their minor involvement in the whole scenario. Back then, both the MCCP, as well as many mainstream media outlets, covered the Bundy arrests, as well as the then-popular narrative against the Bundys. Since then, however, the narrative has changed dramatically and there have recently been major developments in the cases that neither the Chronicle-Progress nor most mainstream media outlets have given much attention. The overall “Bundy” cases were split into multiple trials. Two previous trials of Third Tier Defendants in 2017 both ended in mistrials with hung-juries. 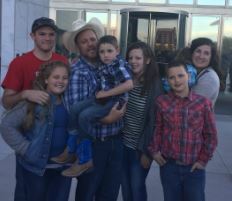 In mid-December, during the middle of a subsequent third trial — the long-awaited trial of “First Tier Defendants”, including Cliven Bundy, Ammon Bundy and Ryan Bundy — all the defendants in the whole case, including Second Tier Defendants Dave and Mel Bundy, who had all been incarcerated for almost two years as they awaited trial, were suddenly released. At that time, Second Tier Defendants, including brothers Dave and Mel Bundy, were not on trial, and their case was still pending and scheduled for trial in 2018. Then, during the middle of the First Tier Trial of Cliven, Ammon and Ryan Bundy, just before Christmas, Judge Gloria Navarro declared a mistrial in that case as well. Although the Second Tier Trial was still scheduled to go forward at the end of February, just last week, on February 7th, the federal government itself moved to dismiss all charges against the Second Tier Defendants, including Dave Bundy, with prejudice, and to vacate the trial date. Consequently, at this point, Dave Bundy is on track to be a free man, with no pending charges. These kind of developments don’t seem to garner the same kind of media attention as the anti-Bundy narrative. But they should. Dave Bundy deserves to have the community he lives in know more of the whole story about what really happened. For more information about the case(s), check out The Bundy Fiasco in Range magazine.